Is "better days ahead" over-egging it? Treasurer Scott Morrison: "Budgets have to be credible." CANBERRA -- In Scott Morrison's second budget, which has left the Treasurer inexplicably described by some commentators as "warm and cuddly," he's been forced to look for different ways to raise revenue and essentially "surrender" to a spending spree. $13.5 billion in so-called "zombie" measures from the 2014 budget that were never going pass the senate are out, leaving the Treasurer little choice but to, shock horror, raise taxes (hello Medicare Levy) and hit up the big banks with a $6.2 billion levy. 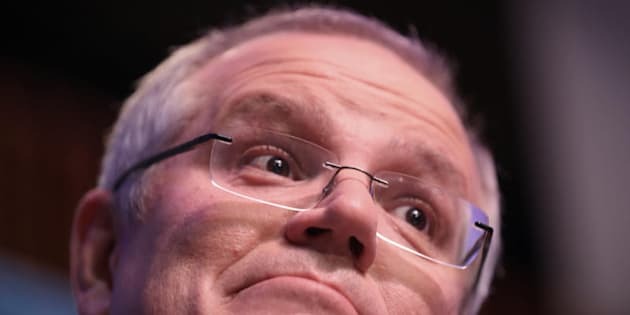 "You know if you can't get to the destination you're trying to get to one way, you've got to go another way, that's what normal people do," Morrison told Sky News in the midst of his budget sell. The current destination is budget surplus of $7.4 billion in 2020-21, and the alternative for the Treasurer is bigger deficit and debt. Budget 2017: All the nitty-gritty numbers you need to know. So later on the stage of the National Press Club, he laid it on the line in a room full of economic and political watchers and players. "Budgets have to be credible. The forecasts have to be real," Morrison said. "And we will debate those amongst the economic circles when all the economists get together." "That's a great lunch, that one." Some laughs from the economists in the room on that one. How likely is a surplus "arrival"? Well the first thing to point out that anything in the budget for four years' time is a projection based on a variety of assumptions, some of which are being called "heroic". Noted budget watcher, Chris Richardson from Deloitte Access Economics, is on that train. Asked specifically by HuffPost Australia if the revenue is there to get Australia where it wants to go, Richardson responded, "no, I don't think so". "I think there is too much optimism baked into those longer term Treasury numbers," he said. What are these upbeat assumptions? Continuing GFC rebound and wages growth, springing from record lows. The budget papers expect wages to leap from two percent to 3.75 in 2020-21, while real GPD jumps from 1.75 percent to 3 percent in four years. A leap in wage growth, despite a move on penalty rates as Labor is arguing. Here's the particular assumption: Treasury is banking on the Australian tax system generating more money, more quickly. Richardson said relying on this was a problem, pointing to the fact that five out of every six dollars of budget repair comes from rising revenues. Not banking levies. Nor Medicare levies. "They have been thinking that for a while and they have been wrong for a while," he said. "This is the sweetest year the economy has seen for a long time. "National income growing $100 billion this year and yet the tax system still has it little legs in the air and is not doing much. And yet the underlying assumption is that from here it does get better. "So take that with a grain of salt." According to economist Stephen Koukoulas from Market Economics, Treasury also assumes the fastest global growth period since the GFC. But he told HuffPost Australia: "We know China is slowing and there are some tensions going on in the global economy." Now the strong message from the Treasurer has been "better days ahead," and there well may be, but any talk of over-egging it is quickly shut down. "Not at all. These are sensible and reasonable assumptions," David Coleman, the Chair of the House of Representatives Standing Committee on Economics, told HuffPost Australia. "I think that if you look at the international economic forecasts in recent months they have been revised up quite substantially. The other really important thing is that in Australia we have really been affected by the running off of the mining boom. "But that process is gradually running its course. That means that drag on the economy, those big projects running off, starts to go away." Perhaps it's a well-worn cliché to say "time will tell," but at this point that is all we have left.